Posted on August 29, 2018 by Genezaret Quintana. This entry was posted in Staying Healthy and tagged Raise the Bar, Staying Healthy, Summer Spotlight. Bookmark the permalink. 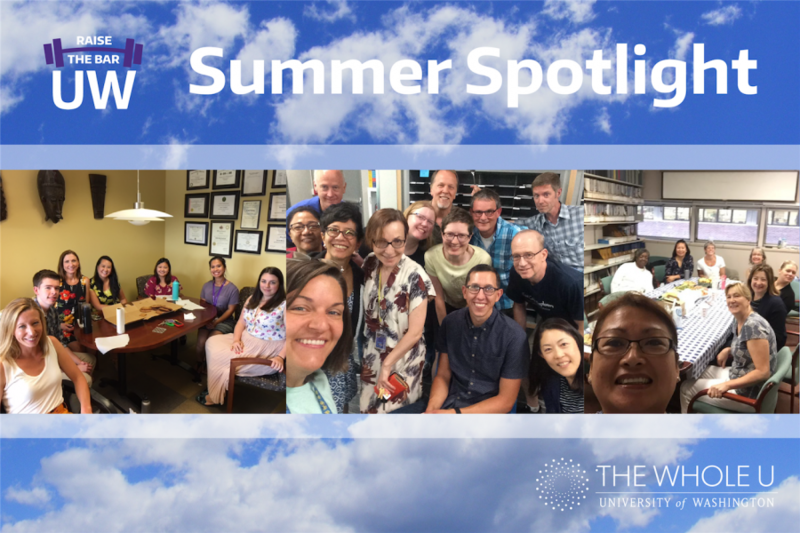 As the skies cleared and the temperature dropped a bit going into our last week of our Raise the Bar summer challenge, teams were able to find a few unique ways to eating well during their lunch hour. See how some teams celebrated the cool down during Week 7 of our summer wellness challenge. We will be putting together a recap for the past 8 weeks of our challenge, so be sure to continue sharing your wellness efforts with us at wholeu@uw.edu. We also encourage you to join our Whole U Being Active Facebook group to post photos and reflections or share via Twitter and Instagram using #raisethebaruw. Catch up on our previous spotlight articles to stay up-to-date. 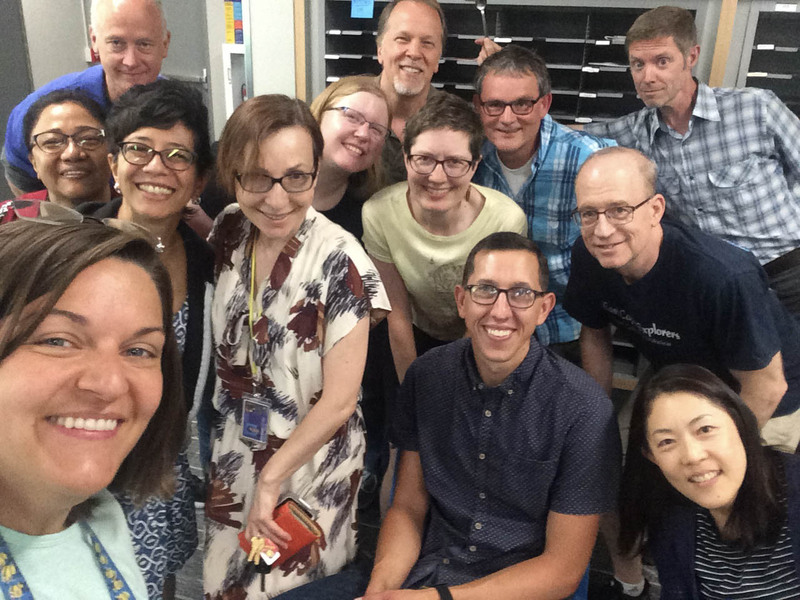 Nina Velikin checked in for Team E-I-E-I-GO of UW’s Data Delivery Group to tell us about their solution to build stronger connections within their team: “Bring your Lunch” Day. “Let’s have everyone get together for lunch… and not a potluck. Let’s just sit together and enjoy each other’s company.” With contagious laughter, smiles galore, and conversations around the group, the team had the opportunity to know each other better simply by having their own lunches, together! While some teams may go out to a nearby restaurant to celebrate a birthday or two, others may host an in-office potluck instead. Team LoKB took it a step further: a “Tasty Tuesday” healthy breakfast potluck! Mary Jane Lohr, project director of the MOMCare Program at the School of Social Work, checked in to show us the amazing food they had at their potluck to celebrate August birthdays. Anna Khoutxaysana, a patient financial specialist II at Harborview Medical Center, shared some more reflections on what she has done to increase wellness efforts in her life, how she sees wellness, and words of encouragement to get you start on your wellness journey. How do you see wellness? you sleep better, and boosts overall mood. Looking for an opportunity in the fall to break a sweat and continue your fitness adventure? Join the Whole U team for the Alaska Airlines Dawg Dash on October 14 and receive $5 off registration and a 6-week training plan! Celebrate the end of the Raise the Bar summer wellness challenge by going out on a team outing to support the Mariners or Sounders during Dawg Daze – all at a discounted price!